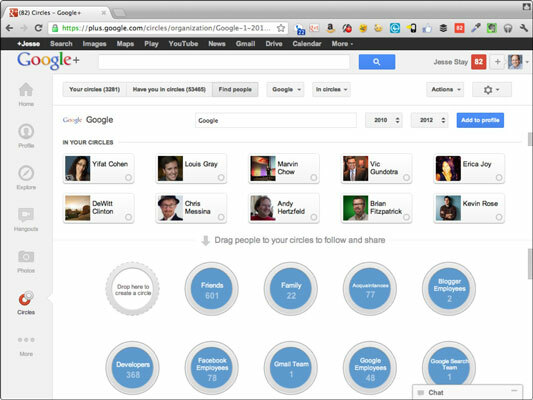 It is a good idea to adjust your Google+ company page so people can search and find you in multiple ways. You can be found more than once. People can find you, follow you, comment to you, shower you with +1s, and share your posts. Your tagline. If you’re looking for people or pages with the main Google+ search, your tagline is one of the most important pieces of your profile to focus on. Start your tagline with the most important keyword. For instance, you want people to find your name when they search for Google+, so your tagline might be similar to Google+ For Dummies Author. If you want people to find you when they search for (say) photographers, include Photographer as the first (or only) word here. The introduction. Believe it or not, people look at this field when they’re trying to figure out whether you’re worth following. The introduction also serves as a source for Google+ search results. The intro doesn’t weigh as heavily on search rankings as people and pages do, but it’s important to have a few important keywords in here. Your employment history. If you go to your Circles tab (via the circles icon on the left of the stream), under Find People, click the All Suggestions drop-down menu. Your previous workplaces and other options are listed there. Select one to specify a time period. You can see other people who have also worked at those places at those times. Your education. As with your employment history, people you went to school with can find you through Google+ search and the Find People option if you complete your education information. The Profile Discovery field. This field determines whether people can find your profile and how they can find it. Make sure Help Others Discover my Profile in Search Results is checked if you want to be discoverable on Google+. Places you’ve lived. You can’t search specifically for people who live in your former cities. Regardless, filling in where you’ve lived adds personality to your profile. Other profiles and the Contributor To field. These sections are very important. 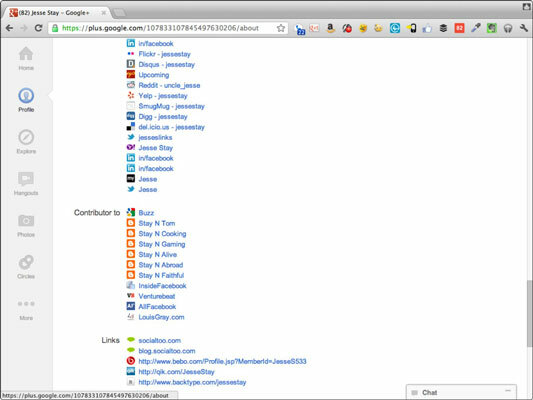 This is a way to tell Google+ what sites are yours on the web, as well as which sites you contribute to. The more you link here, the more Google knows to look at those sites to find traces of you. Filling out your Other profiles and Contributor fields is even more applicable as you start linking your websites and profiles back to your Google+ profile. You can tell Google what sites and contents are yours. On the website, you can tell Google that your Google profile correctly suggests they are yours. This adds a layer of identity and authenticity that will help your Google rankings. Click the profile icon to the left of your stream on Google+ (or click your name or image anywhere on a Google sites). Click the About tab at the top of the profile. Click Edit Profile at the top of the screen. Click a section you would like to change. Edit or add information to the section. When you select the appropriate time period, you’ll see a list of people you either went to school with or worked with at that place, during that time. Click their names and drag them to a circle of your choice. If you find a lot of these folks, then you have an excellent reason to create a Coworkers or Classmates circle.